Sergei Grinkov and Yekaterina Gordeyeva together formed one of the closest partnerships in figure skating both on and off the rink until Grinkov's sudden and premature death from a heart attack in 1995. The story began on the CSKA army ice rink in Moscow in 1982, when Soviet figure skating gurus chose to match up the frail Yekatarina, whose father was a dancer in a traditional folk group, with the sturdy frame of Sergei, the son of an army officer. Too often, the combination of the light-weight, tiny woman with a tall, muscular partner fails to produce the magic formula expected, no matter how great the individual talents of the dancers. In this case, however, the immediate complicity between the two Soviets brought out and accentuated their innate ability, enabling them to produce routines of rare grace. In the latter half of the 1980s the pair were practically invincible, winning four world championships and the gold medal at Calgary in 1988, and they were widely regarded as the most consistently excellent figure skating pair ever. Since 1989, the harmony between them on the rink had been evident too in their personal relationship and in April 1991 they were married. Gordeyeva gave birth to a baby girl, Daria, in September 1992. The couple had already quit the world of amateur skating the previous year to begin a new chapter of their lives on the professional circuit in the United States. Luck was on their side when the International Skating Federation decided to allow professionals to take part in the 1994 Games at Lillehammer in Norway where the pair duly won another gold medal. It seemed they could not put a foot wrong, and their long-term plan was to compete in the Salt Lake City Games together. 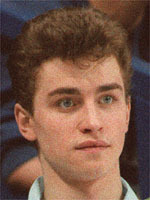 But happiness was replaced with grief when Grinkov collapsed and died at the Lake Placid Olympic rink during a training session in 1995 while attempting a lift with Gordeyeva. He was only 28, a happy and rebellious person, as he showed at one event when he was still performing for the Soviet Union. His traditional CCCP tracksuit top had undergone some radical tailoring: the Soviet star had carefully cut out the four letters, leaving a gaping, provocative, hole.